Former India pacer Amit Bhandari, who is currently the chairman of the Delhi & District Cricket Association (DDCA) senior selection committee, was assaulted on Monday at the U-23 team's trials at St. Stephen's ground. During the trial session, Bhandari was attacked by a group of as yet unidentified people, who fled before the cops could arrive. Bhandari had to be hospitalized. According to eye witnesses, the assault took place while Bhandari was watching probables play a trial match. First, a couple of men went up to Bhandari, and a heated exchange followed. They left subsequently, but returned quickly with a group of about 15 men, who were armed with hockey sticks, rods, and cycle chains. "The SHO from the local police station has reached the Stephen's ground and I have personally spoken to the Delhi Police Commissioner Amulya Patnaik. The guilty will not go unpunished. I promise exemplary action against whoever is found involved in this misdeed," said DDCA president Rajat Sharma. The goons quickly descended on Bhandari, and attacked him relentlessly. When others present at the ground rushed to his aid, the goons warned them to stay away, and threatened to shoot them if they intervened. The attack left Bhandari with head and ear injuries, and the former pacer was then rushed to the Sant Paramanand Hospital at Civil Lines. The motive behind the attack is not clear as of now, but police suspect that it could be related to one disgruntled player who did not make it to the probables list for the national U-23 tournament. Police are currently probing the attack, and have said that there'll be more clarity once Bhandari recovers from shock and gives his statement. Bhandari was actively playing during the early 2000s, but never made a name for himself in the Indian cricket team. He played two ODI matches for India, making a poor debut against Pakistan in 2000. 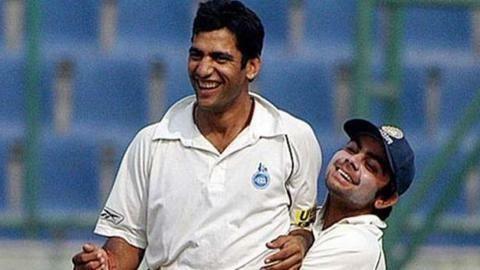 He was dropped for four years, and played his last match for India against Zimbabwe in 2004.